Raise your hand if you’re reading to pack your bags RIGHT NOW? If this persistently cold April weather is doing anything other than making me extremely frustrated with my wardrobe, it’s also making me want to leave town. Like tonight. On the first flight out. To somewhere warm, with dappled light and outdoor patios. Where sipping my morning coffee outside is the only reasonable option to wake up in the morning and my evening plans consist of nothing other than wandering around new-to-me cobble stone streets in search of the most inviting looking, family run restaurant — the smell of pasta and fresh baked bread being our guide. Since none of the above is on my immediate horizon (until my London adventure next month! 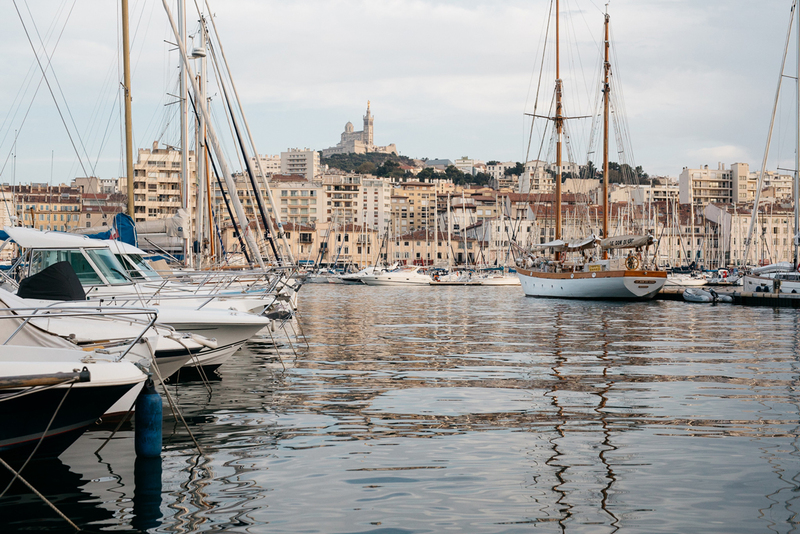 ), then these photos from our trip to the South of France last August will have to do. 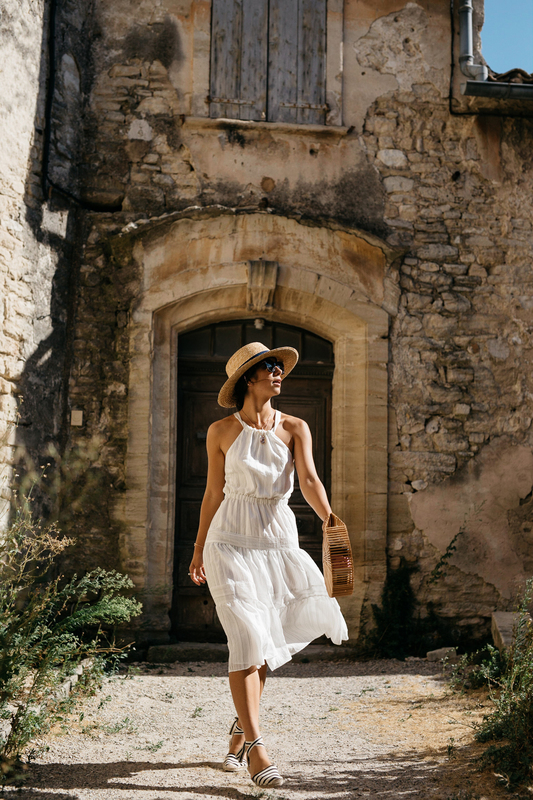 Some of you may recall, this past summer my guy and I hopped over to Germany for his good friends’ wedding, but before hand, we decided to spend about a week driving around the Provence region. To say we were driving around in a dream state would be an understatement. Like everyone else who ventures to this part of the world, I too fell in love. Head over heels, in love. 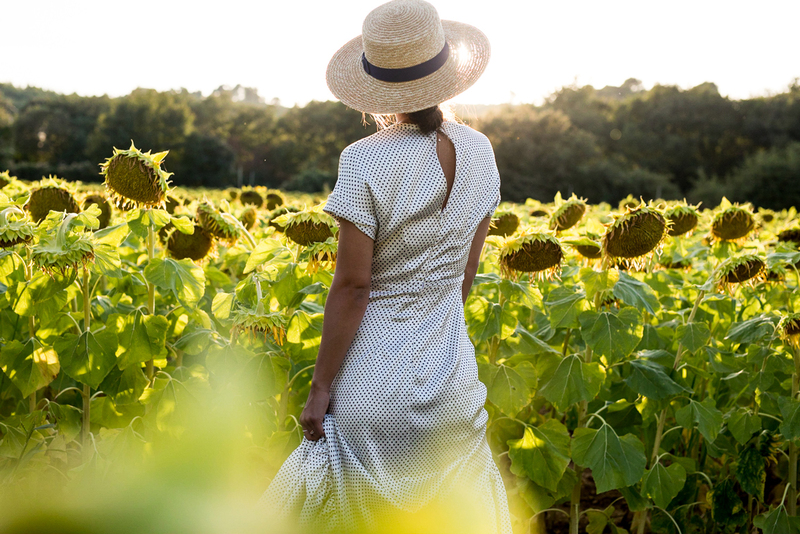 The rustic charm of each sleepy, hill-side town, the rolling fields of lavender and sunflowers, leaving a distinct fragrance lingering in the air, the heaviness of the sun, beckoning you to rest your eyes and tilt your head back at every opportunity. It was, without a doubt, one of my favorite trips to date. And to be completely frank, we winged a lot of it — a lot of which, I wanted to share with you guys today, the good and the not-so-great that I wish I had known about before. First things first: timing! 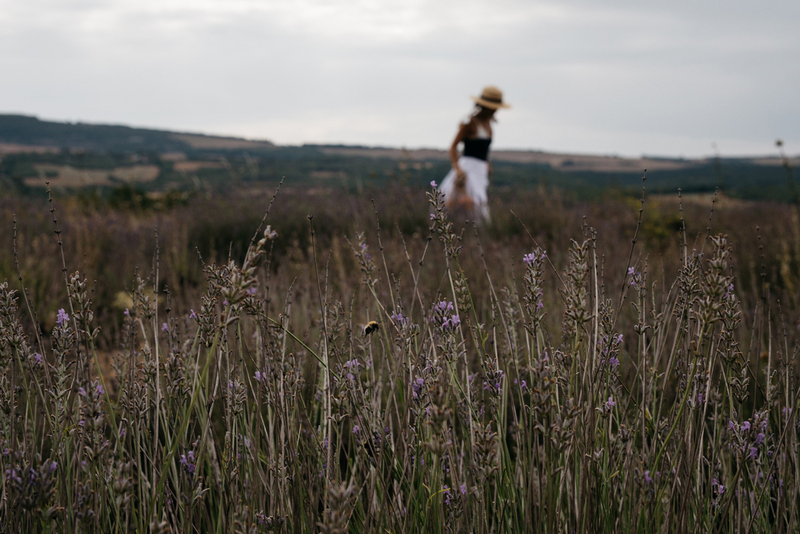 We’ve all seen the beautiful Instagram photos of rows and rows of lavender fields — purple and thick enough to just smell through your screen. 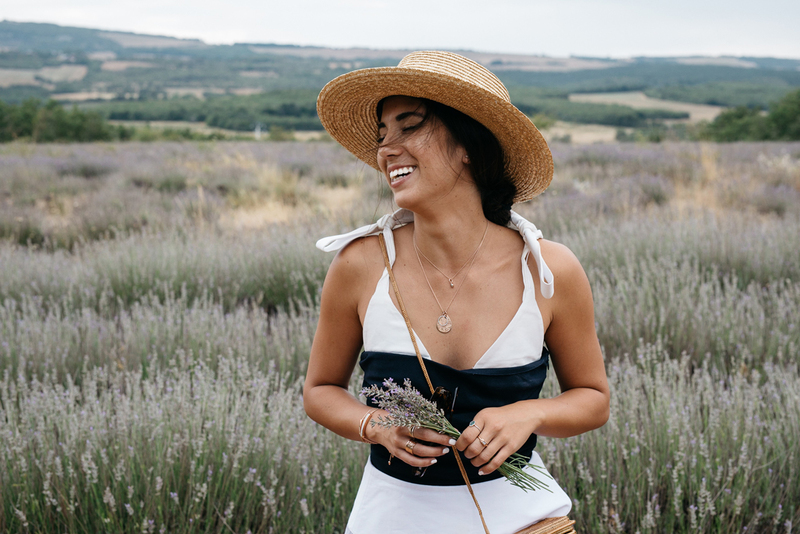 Peak lavender bloom in Provence varies greatly depending on the rainfall that year, but generally speaking, it spans from the last week of June to early August. If you want to spot the sunflowers and lavender together, best bet would be to aim for July. Since we were heading over mid-August, I had already resigned to the fact we may or may not see much of either in their full glory. But that didn’t stop me from trying. Sure enough, as we were driving around the area from town to town, most lavender fields had already been harvested and the sunflowers were starting to wilt, with folks in each town telling us the same story in broken English, “We’re sorry, you’re too late.” Much to the chagrin of my boyfriend, I’m pretty determined and we eventually found one as we were just aimlessly driving around (which I highly recommend you do anyway). It was likely a left over field that hadn’t yielded a full crop, but it was still beautiful! 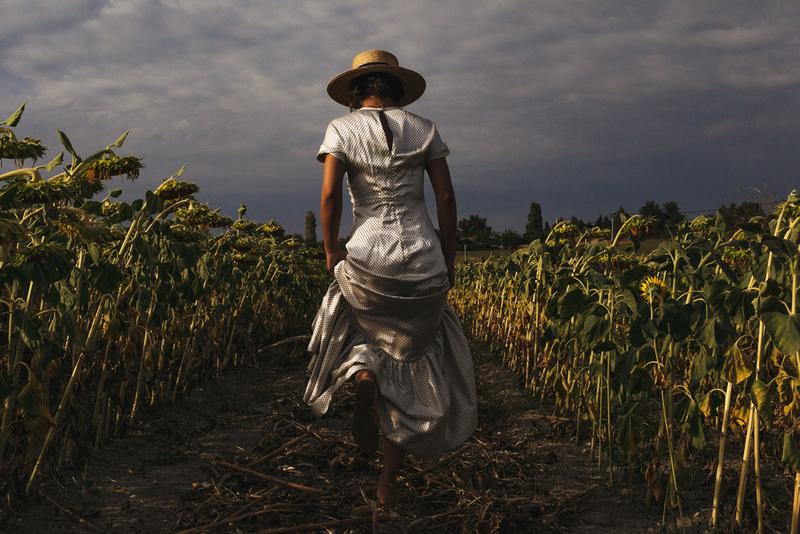 As for sunflowers, we both actually admired how regal the wilting flowers looked too — much like a van Gogh painting. Take the train from Paris to Avignon and rent a car: We flew into Paris for a few days (you can see those photos here), and then took the train down to Avignon. Avignon seemed to have the most car rental options, so I would recommend stopping here regardless if you’re staying in town or not, and drive to your next destination. On that note, I cannot recommend renting a car enough! It’s probably the only way to really hop around the area and experience it. 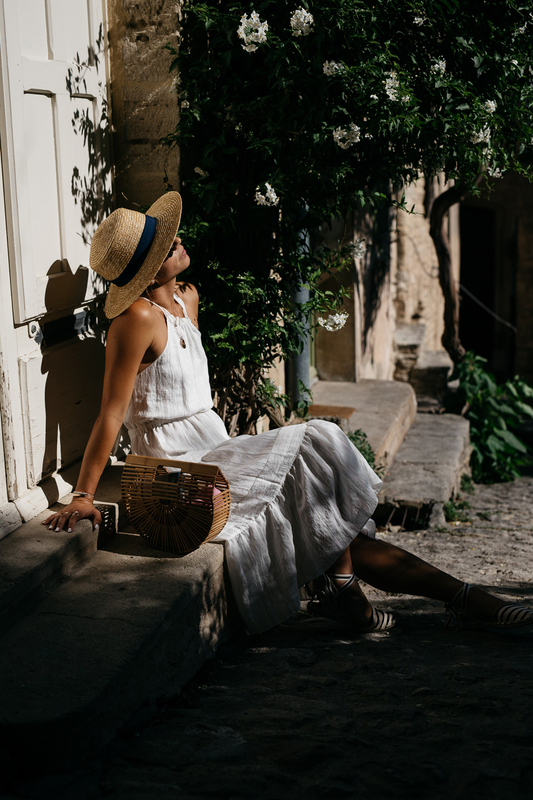 Stay in one town, rent an AirBnB: We opted to stay in Avignon, although there are plenty of charming options in the area — each more quaint than the next, so it’s hard to find a disappointing option. For the sake of ease, I would recommend staying in just one town, rent a spot on AirBnB (we didn’t look into many hotels, but I just loved staying in apartment in smaller/town-like places because it feels like you actually live there), and day hop everywhere. We happened to stay at this apartment and LOVED it. Parking was nearby and easy/cheap and it was smack dab in the middle of the historic parts of the city. Go to Gordes! So, this is a good anecdote as to how much we winged this trip. 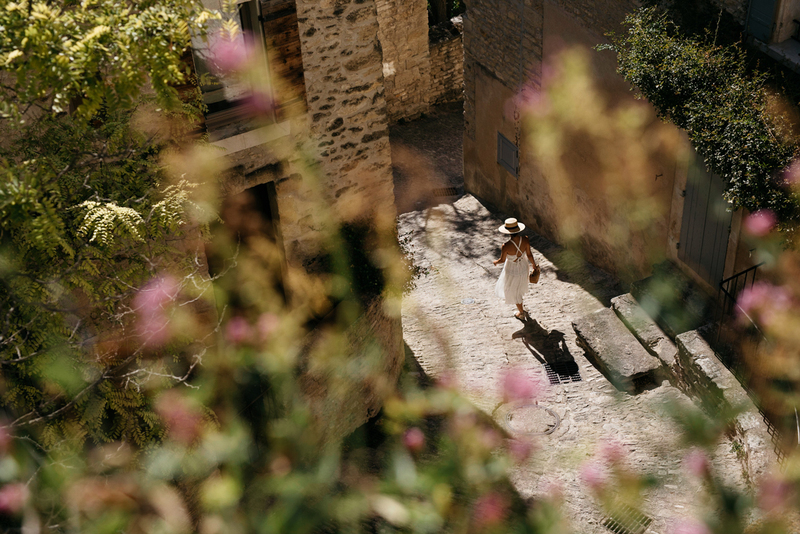 We were actually looking for the Sénanque Abbey, a Cistercian monastery known for its lavender fields, when a road closure and subsequent detour took us to the nearby town of Gordes. 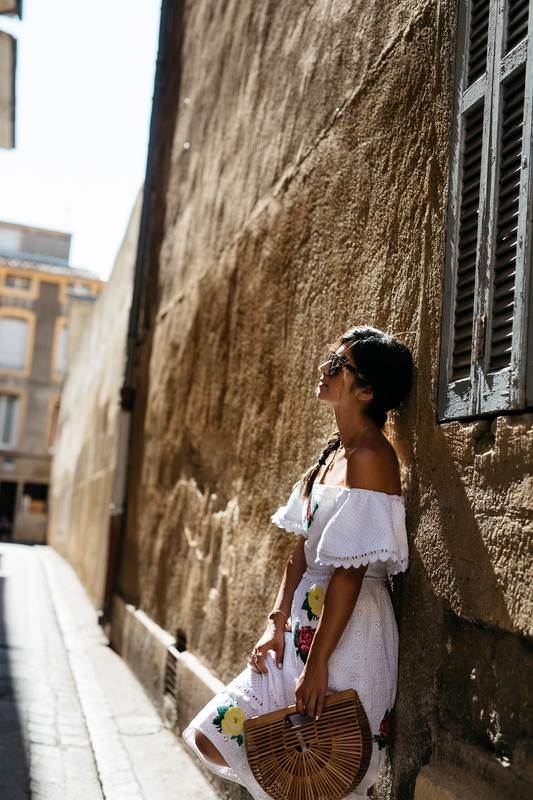 When we were walking around this picturesque hillside town, we were amazed by our luck — stumbling upon such an amazing gem. 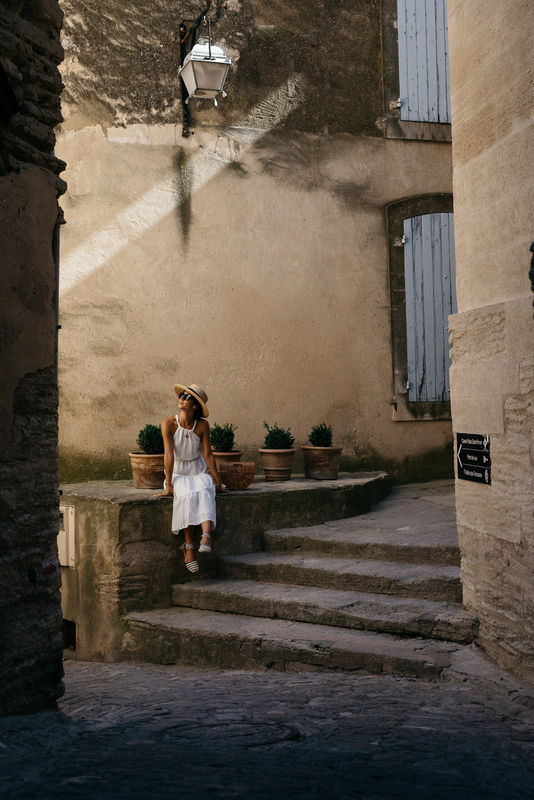 Most of my favorite photos from the trip were snapped the afternoon we walked around Gordes — definitely put it on your must-see list. 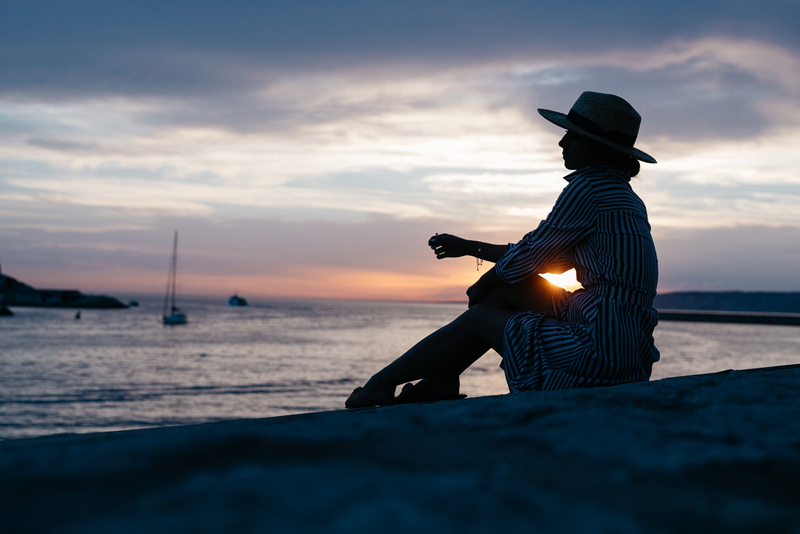 Allow time to get lost: Of course, while you’re making that must-see list, definitely allow yourself time to just get lost. It’s 99% of the beauty of a trip like this and you’ll regret it if you plan things out to the Nth degree. We simply plotted out regions we wanted to drive through for the day, put on some playlists and stopped when the vistas were too good to pass up (or when we got hungry, which was often). 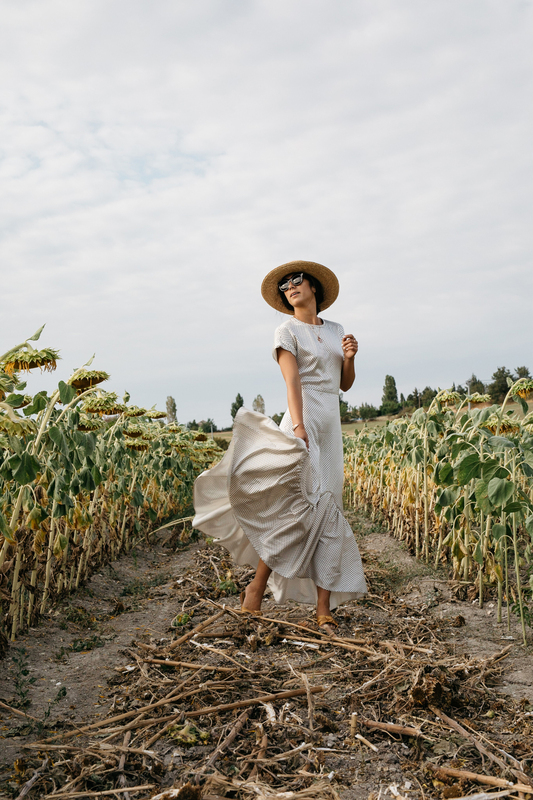 A warning about lavender and sunflower fields: Something to note, that I don’t think makes it into the captions of some beautiful lavender field shots — make no mistake, they’re swarming with bees. Covered. So if you’re determined to get a shot of yourself in the field like I was, skip your perfume and any other scented lotions for the day to avoid drawing more attention to yourself. Brush up on your French: This probably goes without saying, but as someone who knows little to no French, you’ll do yourself a favor if you brush up on key phrases before you head south. Unlike Paris or even Nice, where there’s a fair deal of English, most of these small towns don’t speak much or any English, so you’ll need a handful of French to help you get by. How about you guys? 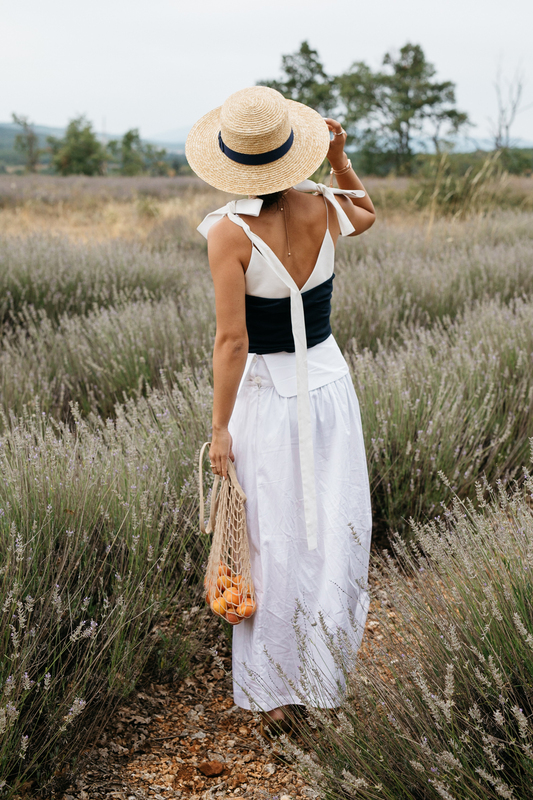 Have you been to the Provence region before? Where did you go? And did you fall madly in love, like I did? 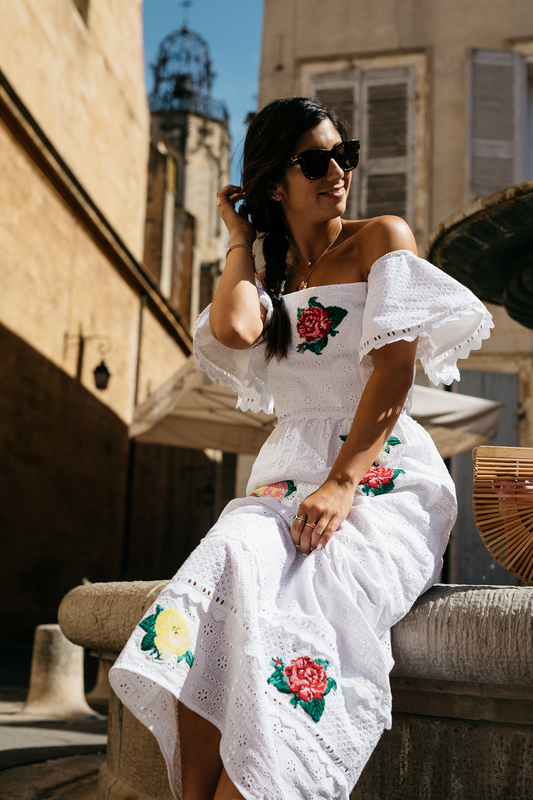 Style, Travel and provence, south of france, summer outfits, travel, travel style. Love these tips! Can you please do a post about the shoes to wear for getting lost on the cobblestone streets?! For some reason, every time I go abroad, I struggle to find cute shoes that are comfortable for long periods of walking! Of course! I basically lived in just two pairs for this whole trip! I’ll add them to this post here! Satin slides and espadrilles will be your best friend! OMG totally wanderlusting right now! 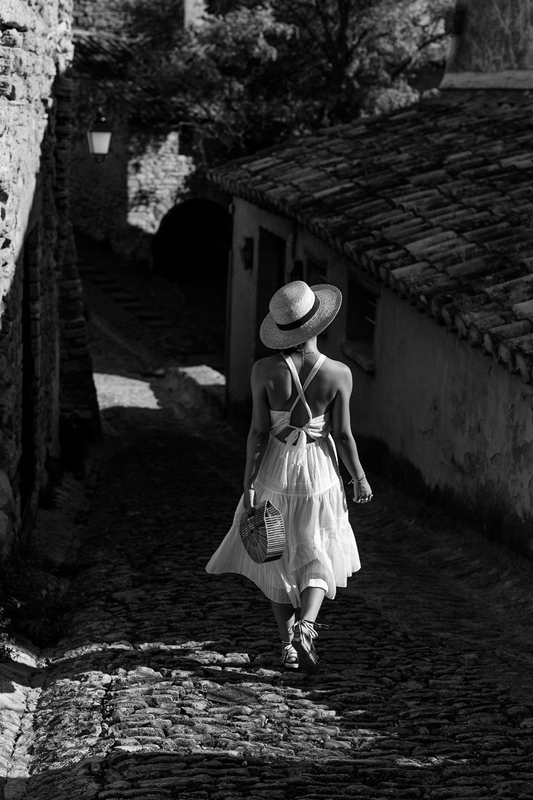 I want to go to Provence! Ahh, these images … take me away! This actually makes me look forward to the warmer days ahead! I think these are your best photos to date! How did you hold them hostage for so long?! I may be partial since they’re in France ☺️ Thanks for the tips. Now I know to go in July over August! Beautiful dresses and pictures! Such a beautiful region! WOW WOW WOW Krystal these pictures are absolutely breathtaking. My goodness girl! I’m def ready to pack my bags!